Here is a very nice bust headless man. It has a metal sleeve that brings a touch of modernity. This bust has no arms but down to mid-thigh. Polypropylene, this man mannequin bust requires little maintenance. It is very easy to handle it. This bust man has no age; it was designed for optimal duration. This bust is easily adapted to various displays and collections of the moment. This man bust is available in delivery. 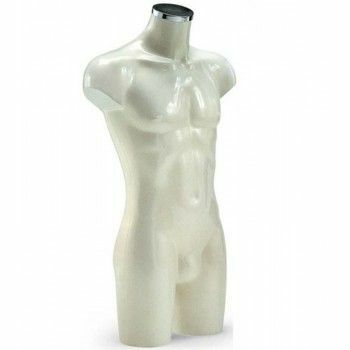 Elegant bust man pearly white polypropylene with either fixing or base. The dimensions of this bust is 92 cm in height, a 98 cm bust, waist a tour of 76 cm and a hip measurement of 94 cm.